+ In order to Grow, you have to broaden your perspective. + You have to clarify your role. + You have to build a strong leadership team. + The leader needs to grow from being "time tellers" to "clock builders". 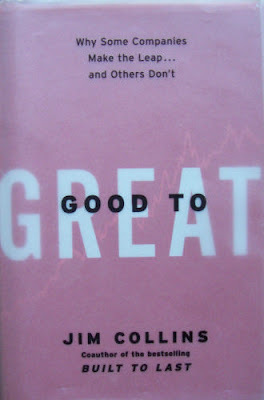 + Good is the enemy of Great. + Greatness is not a function of Circumstance, but Rather a function of individual Choice and Discipline. + Mediocrity is the result of chronic inconsistency. If these tidbits do not mean anything to you, I encourage you to check out the material that is freely available on his web site.